Imagine how amazing it is to see the shadow of our Moon on Earth with your own eyes as it happens! Most of us will not have a chance to go to Space to see this. Even if you can afford to go to Space during a solar eclipse (which will most probably double the price of your ticket), ironically, you need something to show up so Moon's shadow can be clearly seen - clouds! So what is the next best thing for those of us who will be stuck on Earth for the rest of our lifetime? How about observing solar eclipses on a distant world (Jupiter) from Space (on Earth) through telescopes! Jupiter has more than 60 over moons! But only the largest four of them are visible at bright dots of light through amateur-size telescopes and binoculars - Io, Europa, Ganymede and Callisto. Since these moons revolve around gigantic Jupiter and Sun is illuminating both of them at times, there will be certain periods where these moons will cast their shadows on Jupiter. These periods are known astronomically as Galilean Satellite Shadow Transits. Since Jupiter is a giant gas planet, these moon shadows are projected on a dense "smoke screen". Thus, they can be seen very distinctly through telescopes - pitch black circular spots on the disc of Jupiter. On clear enough nights, you can enjoy this view even if you are located in a light-polluted city. And if you have nice view of the sky at home, you may even be able to observe this celestial wonder in the comfort of your bedroom and in your favourite space-themed pajamas! Who wants to risk their life getting lost in Space after an accident on the International Space Station anyway? Not so scary you say? Go watch Sandra Bullock in Gravity which is opening next month in Singapore! So how can we know in advance when these shadow transits is going to occur? One user-friendly way is via this free web app by Sky & Telescope. A more powerful and graphical free desktop software is WinJUPOS. It has a more intimidating user-interface for newcomers to stargazing. Hope to find time to do a video tutorial on how to use it to plan for Jupiter-observing sessions. - Jupiter not be visible from your observing location - it may be below the horizon, too near the Sun or the sky might be cloudy. - It may not be a convenient time to observe when it happens - e.g. middle of the night, family and work commitments. - Access to a telescope. Considering these factors, to be able to observe one such shadow transits should be consider rare. Try asking all of your friends on Facebook if they have even seen one. Their response will most probably be "Shadow what? You mean we can actually see planets through a telescope?". Amateur astronomers (or most people for that matter) like to brag about seeing or photographing super rare stuff. (Btw, have you seen the once-in-a-lifetime Transit of Venus on 6th June 2012? :P) That's why to see one shadow transit moving across Jupiter is rare. Two, very rare! THREE? Oh-my-god-you-lucky-***** rare! Due to the astrophysics involved between Jupiter and these four moons, three shadow transits appearing on Jupiter at the same time is the maximum, not four. Which brings me to my main motivation for writing this blog - most of the western astronomical publications and forum discussions mainly focus on shadow transits that are visible in their countries. Imagine my excitement while playing with WinJUPOS a few weeks ago, I found out that in October 2013, there are THREE double shadow transits that can be seen in Singapore and many countries in the East! YAY! (1) For the month of October in Singapore, Jupiter rises above the horizon at about 1:41 am on 1 October. It rises earlier and earlier everyday and by 31 October, rises at about 11:52pm. (2) Under clear sky conditions, it is possible to observe Jupiter until at least 7am in Singapore in October. Of course, pre-dawn dark sky is more preferable compared to the brighter bluish twlight skies. (3) If the shadow transits happens when Jupiter is high up in the dark sky, the view will be potentially clearer and less distorted assuming everything else remain the same. (4) Shadows that are very near the edges of Jupiter may be difficult to spot due to curvature of spherical object like Jupiter. (1) Super rare Triple Shadow Transit on 12 October not visible from Singapore! So if you really keen to see this, plan to go overseas to the other side of Earth in advance! 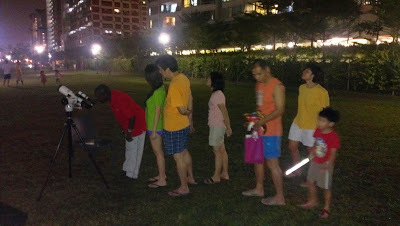 (2) Three double shadow transits visible in Singapore - 16th , 23rd and 30th. Three chances to catch at least one of them. (3) All three double shadow transits falls on a Wednesday early morning before sunrise. Easy to remember - last three Wednesdays of October. (4) To be able to see Jupiter's Great "Red" Spot (GRS) during multiple shadow transits is a rare visual bonus. 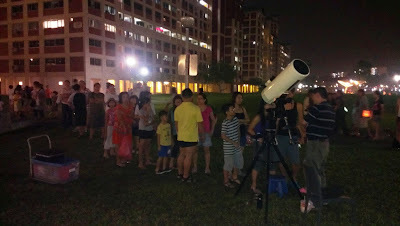 Unfortunately, GRS is not visible for these shadow transits visible in Singapore. (5) 15 Oct is a public holiday (Hari Raya Haji). Get plenty of sleep on that day so you can stay awake for the shadow transits on early morning of 16th. (6) Duration of multiple shadow transits can be very short - e.g. one egressing out of Jupiter a few minutes after the ingress of the other. For these shadow transits in October 2013, they are much longer on average - more than one hour! Plenty of time to observe with diferent telescopes and accessories, take photos/videos and socialise with other stargazers! Update at 9pm: Tonight's moon-gazing event at Toa Payoh Central cancelled due to bad weather. 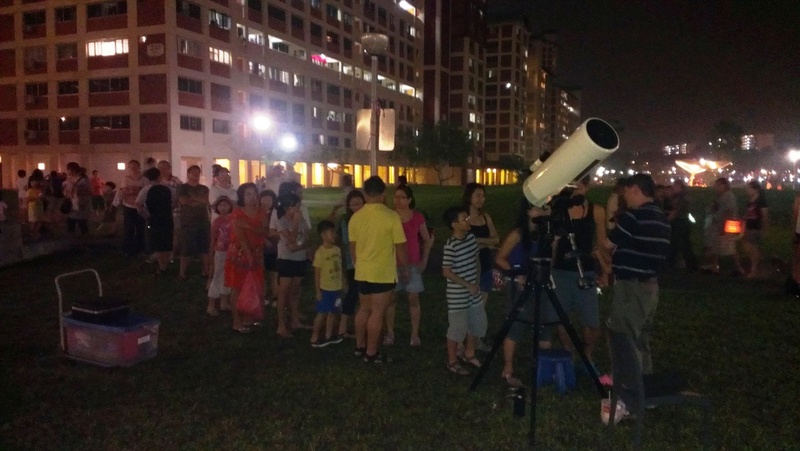 Weather permitting, we will be have a full moon stargazing session at open grounds outside Toa Payoh Public Library tonight. From 7:30pm. Come join in the fun with or without telescopes/mooncakes/lanterns! 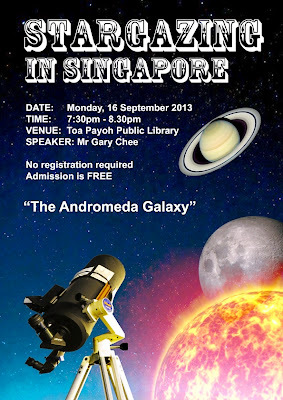 The next public stargazing talk I will be conducting is titled "The Andromeda Galaxy". Do you know under clear skies and at the appropriate time of the year, you can see the largest object in the Universe with your eyes alone? Imagine if you have access to a telescope or binocular to enhance that view! So come and find out more about the amazing Andromeda Galaxy - its fascinating mythology, scientific research value and how to locate it in the night sky. *Weather permitting*, during/after the talk, there will be an impromptu live stargazing session at open space just outside the library. You can observe stars and Saturn through our telescopes! 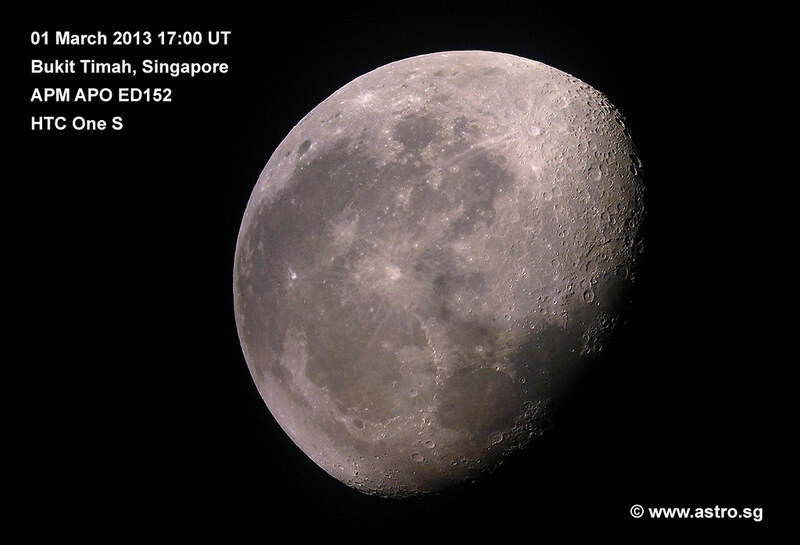 It's also the Mid-Autumn festival so come and see the gorgeous Moon - its craters, mountains, valleys and more! Bring your family and friends along and acquire skills that will enable you to enjoy stargazing for the rest of your life! 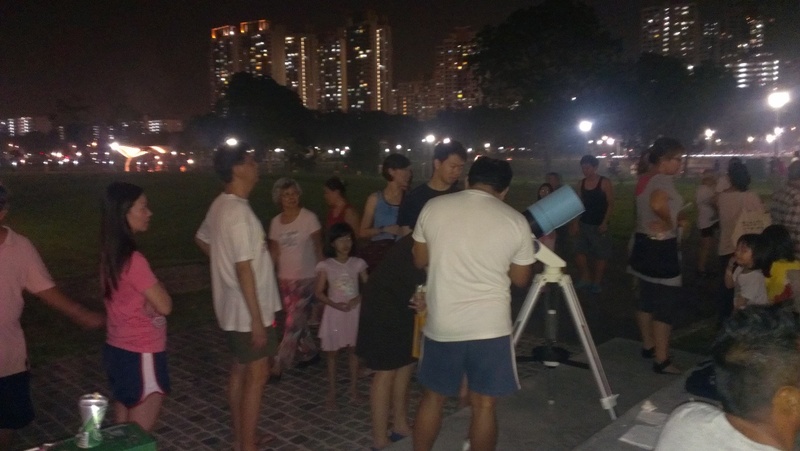 In celebration of Mid-Autumn Festival, *weather permitting*, my friends and I will be conducting a Moon/Star-gazing session at Bishan - Ang Mo Kio Park this coming Saturday. Time: 7:00 pm till very late evening. We will be bringing our telescopes to observe planets, star clusters and the beautiful Moon of course! You may use your handphone to take photos of the Moon directly through the telescope too! Yes. This is shot with my phone handheld over a telescope! No complex DLSR setup involved! No kidding! One the same evening, there will be a major Mid-Autumn event organised by a Teck Ghee constituency (Ang Mo Kio). The Prime Minister is the guest-of-honour. So expect the Bishan Park carpark to be full and very packed. If you are driving, you may want to park at the multi-storey carpark along Ang Mo Kio Avenue 1 and walk over instead. Or take public transport and alight at bus-stop near Bishan Street 22/25. Do bring your kids and their lanterns along and join in the festive mood! For event photographers, this is also a good opportunity to practice their night shoots under challenging lighting conditions. Want to take this opportunity to thank Nparks for being supportive of our mid-autumn stargazing event last year and this upcoming one! Please take note this event is totally weather dependent. In case of bad weather, we may cancel it last minute. Please check this blog regularly on that evening for the latest updates or follow my tweets at http://www.twitter.com/astrosg. There is a phenomenal amount of astronomical resources which can be borrowed from our public libraries - books, magazines audio-visual materials and even ebook readers. Due to the complexity of astronomy and practical stargazing to a newcomer, acquiring bits and pieces of random unorganised information from the internet may create more confusion. And in the process, wasting more time compared to the apparently "slow" alternative of reading good books. In my opinion, reading well-written and organised books on astronomy is still the BEST way to get started into the wonderful hobby of practical stargazing. Good beginner books on this subject matter is written in clear and concise language with visually stimulating illustrations. To fully appreciate and enjoy stargazing, one need to acquire general knowledge of astronomy, practical knowledge of operating astronomical equipment as well as observation and astrophotography skills. Here are some listings of my favourite astronomical resources available in our public libraries. You can click on these text hyperlinks to check if they are available for loan and in which specific libraries. If all copies are on loan, you may reserve them online and have them delivered to your nearest public library for self-collection for a reasonable fee of $1.55. *Not a very scientific series but can be hilarious to watch! I will try to update this list as and when I manage to recall some of the good books I have come across as well as those that cannot be borrowed (reference only). For more information about the location and opening hours of public libraries in Singapore, please visit the official National Library Board website. Galaxy Astronomy Club and the Andromeda Observatory was featured in Channel U's TV show "Secrets in the Hood" (episode 5) on Tuesday 3rd September 2013! Hosted by MediaCorp artiste Pornsak Prajakwit (@Pornsak_P), this TV series is about revealing the lesser known interesting places and good food at various parts of Singapore. The show is mainly in Chinese with Chinese subtitles when the locals being interviewed speak in English. This particular episode was first broadcasted at 9pm followed by a repeat telecast at 12:30am (4 Sept). The astronomy segment is from 33:03 - 38:25 minute marks. I am not able to make the video player jump to this particular astronomical segment in my internet browsers. If that's the same for you too, just hit the pause button and let the programme buffer all the way before jumping back to the 33 minute mark to watch it. Watch it in high quality full-screen mode for best experience. Since the astronomy segment is conducted in Chinese, I shall try my best to translate them for those who don't understand this language. My Chinese standard is only average. Please forgive me for any translation errors and feel free to suggest better ones by commenting at his blog. The astronomy club president who is dressed in a white T-shirt is Jin Peng (JP) and the host is Pornsak. I do not know the name of that young lady that was being interviewed. [Pornsak] Tonight we are going to stargaze. Let me take a look at the sunset first since the sun is setting. (Narration) Suhaimi (Yusof) told me after looking at the sunset, I can still go to a special place in Woodlands to stargaze. And the stars there are extra big. Where will this hint lead me to? Do you believe you can see extra big stars in Woodlands? There's an observatory at the Woodlands Galaxy Community Club! Suhaimi told me his family's favourite activity is to come here to stargaze. Apparently, there is an observatory at the 6th storey of this community club. I know Singapore Science Centre and (unknown) have observatories. But Woodlands CC? Ok. The truth will be known when the lift door opens. Feeling excited! Here we are! [Pornsak] Wow, so dark. Who are you? Please come quickly and introduce yourself! [Jin Peng] Hello, how are you? I can't really see you clearly! Haha. My name is Jin Peng. [Jin Peng] We belongs to an astronomy club. We meet up on every Fridays and Saturdays. [Pornsak] So it is a really an astronomy club. (Shining torchlight at own face). When I am speaking, I need to provide my own source of lighting! This is the first time! Hello ladies! Can you make yourselves more visible else our TV audience may not believe you gals are really here. (Shining torchlight at the ladies) Feels like I am about to arrest someone. Please show my your identification cards! Are there a lot people that come to visit this place? [Pornsak] Really? You are not kidding me right? [Pornsak] Lights! (Bright lighting revealing more people standing around) Wow. Hello, how are you guys? Really a lot of people here! Four telescopes here, so how long is the average waiting queue? [Lady] About 5 to 10 minutes. [Pornsak] So you guys have to stay outdoors here? What happens when it rains? [Jin Peng] If the weather is unfavourable, we will inform the public about an hour in advance via Facebook and Twitter that the session will be cancelled. [Pornsak] So what is name of your astronomy group? [Jin Peng] Our group is known as Galaxy Astronomy Club. [Pornsak] So for those who are thinking of coming, please check their Facebook page first. It may be possible to be raining here at Woodlands (north) even though it is not in Tampines (east) where you stay. You may not know. (Looking at JP) You guys are located in the heartlands. So if I point this telescope towards the back (where there are residential buildings), am I able to look into the resident's houses? [Jin Peng] No no no! [Pornsak] Hahaha. Ok! (Pointing at the observatory) So is this space-ship like object the observatory? Do you have the keys to it? [Pornsak] So you are indeed the club president. Can you bring me in to take a look? [Jin Peng] Yes. This way please. [Pornsak] (Turning back) Thank you everybody! Shall not trouble you guys further! Thank you! (Narration) Galaxy Astronomy Club helps the community club to take care of the only observatory in Singapore that is built in the residential area. It was set up with the help from various organisations. [Pornsak] (Inside the observatory) This instrument looks like something that came out of a Star Wars movie. This is a big-Mac sized telescope! How far can this telescope see? [Pornsak] Really? So can I take a look now? [Jin Peng] Yes. You can take a look at Saturn now. [Jin Peng] This is to point at the object. Point towards the object we wish to look at. Whereas this (the primary telescope) gives a more zoomed in view. [Pornsak] Oh, I understand what you mean. So this (the main telescope) is for viewing. But this (the refractor) is for adjustments. [Pornsak] Ok. If you do not mind, I am going to take a look now. [Jin Peng] Ok. This is the magnified view of the object. You can see Saturn. [Pornsak] Yes. It is at the 9 o'clock position in the field-of-view now. Is this Saturn? Just like what I saw in the books - a ball and a halo around it! [Jin Peng] Yes. The rings of Saturn. [Pornsak] Huh! (Takes a look at Saturn through the telescope again) Or is it you guys drew it inside the telescope? Hahaha. [Jin Peng] No no no! It's really that dot of light in the sky! (Narration) The club president says the telescope has been set up to follow Saturn wherever it is moving to. [Jin Peng] After a few months you may be able to see different planets. [Jin Peng] Yes. These few months you can see Saturn. After September/October you can see Mars rising up. [Jin Peng] Yes. This is one of the (astronomical) apps for iPhone. [Pornsak] If I can use see Saturn using my phone, why do I need to come here and look at it? [Jin Peng] Not necessarily. Because sometimes you need an internet connection. Secondly, you may only know roughly where Saturn is at in the sky but not its actual position. [Pornsak] Oh. You can only see it as a dot but not its actual beauty right? (Narration while beautiful telescopes and astro photographs are shown) And do you know, constellations can actually be seen with the naked eyes? After every few months, some constellations will appear while others will be hidden. The club president says they teach others how to identify constellations. But to be able to know all the constellations very well might take a year. 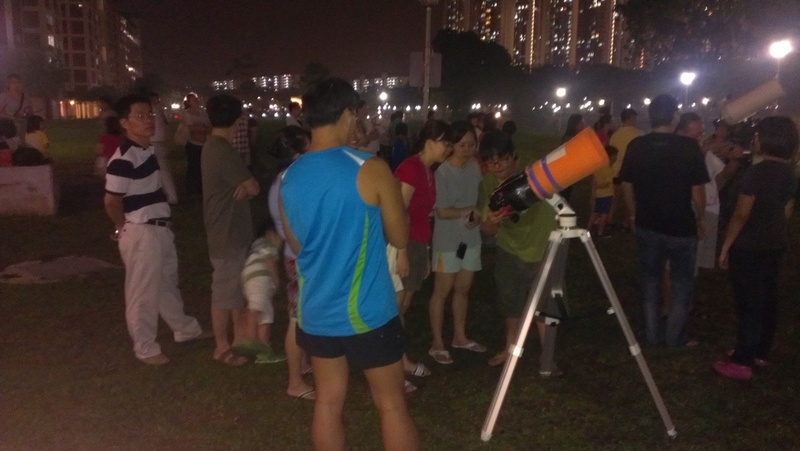 The community club's weekly astronomical activities are opened to the public. For only $1 per person, you can see lots of stars right in front of your eyes! How can you miss such opportunities? But just one important comment here for those who are not familiar with JP. He knows his astronomy stuff very well. But because his not very fluent in spoken Chinese and the Chinese astronomical terminologies AND the fact that Pornsak is new to practical stargazing and telescopes, there are some minor astronomical misunderstanding created between the host and JP. But ironically, this makes the programme more entertaining for me (and most probably other bilingual good-English-but-average-Chinese amateur astronomers)! For example, the part about which telescopes to look through. When I watched it on TV, I was like "OH MY GOD! Er...er....er.... what's "finderscope" in Chinese??!! Arghh!!" LOL! In most TV productions, there will be a lot of things said and filmed that will not make it to the actual show. For a relatively technical subject like astronomy and practical stargazing, a minor edit or omission during a conversation during post-production may inadvertently change the meaning and context of what was being said! Once again, congrats to Galaxy Astronomy Club for promoting amateur astronomy in Singapore! When was the last time you saw local amateur astronomy featured on TV for more than 30 seconds? Let alone a 5 minutes 22 seconds segment on prime-time TV at 9pm! So kudos to the suits behind Channel U for featuring astronomy in this series and Pornsak for being an entertaining host! Weather permitting, go visit the Andromeda Observatory at Woodlands Galaxy Community Club this weekend while Saturn is still visible for this year!